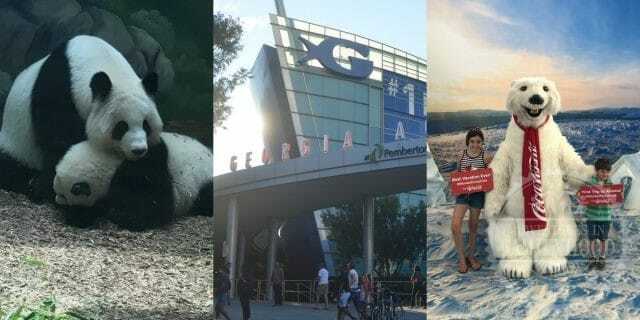 Thank you to the Atlanta Conventions and Visitors Bureau, Hyatt Place Downtown/Atlanta, World of Coca-Cola, Georgia Aquarium, Max’s Coal Oven Pizzeria, and Zoo Atlanta for hosting us during our trip to Atlanta. All opinions are my own. If you’ve never been to Atlanta with your kids, you need to put it on your bucket list now. Not only is there plenty to do, but many of the family friendly attractions are just steps away from each other. We recently spent 3 days in Atlanta with our kids. Both the variety of the attractions and the convenience of their locations makes Atlanta appealing to families. After not having the city on our radar before, it’s now become a destination we will return to again and again. After checking into our hotel, we took a short walk to Pemberton Place (home to World of Coca-Cola, Georgia Aquarium and the Center for Civil and Human Rights) Having arrived in Atlanta mid afternoon, we planned on spending the rest of our day at World of Coca-Cola. It’s a fun place to learn about the history of the Coca-Cola company. Once you’re inside, you’re given a free sample of a Coca-Cola product before you are treated to a short presentation and video. After that you are free to roam about the museum at your own pace. 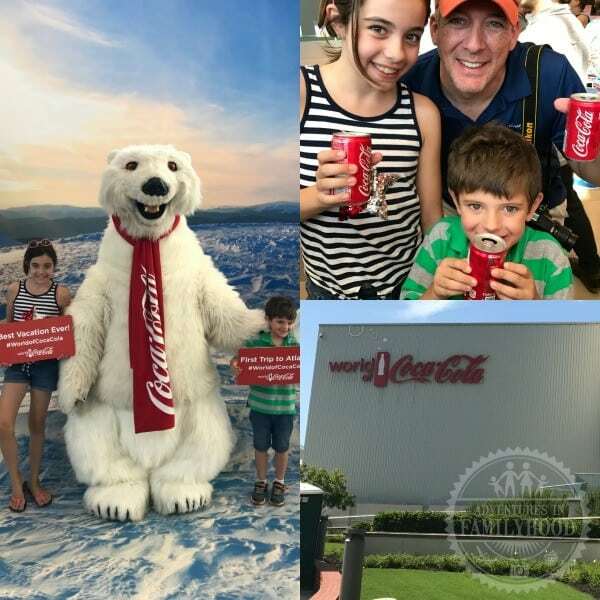 During our visit we met the famous Polar Bear, sampled some Coca-Cola products from around the world (yes, they even had the Beverly) and even got to hold the Olympic torch. It takes about 1 and half hours to tour the museum. Be sure to arrive early because the late afternoon lines can be long. Georgia Aquarium is ranked as the #1 aquarium in the United States, and now we know why. We made sure to arrive early to avoid crowds. What I loved the most about Georgia Aquarium was its size. It’s not too big so you feel overwhelmed and its not too small so you feel like you’ve missed out. 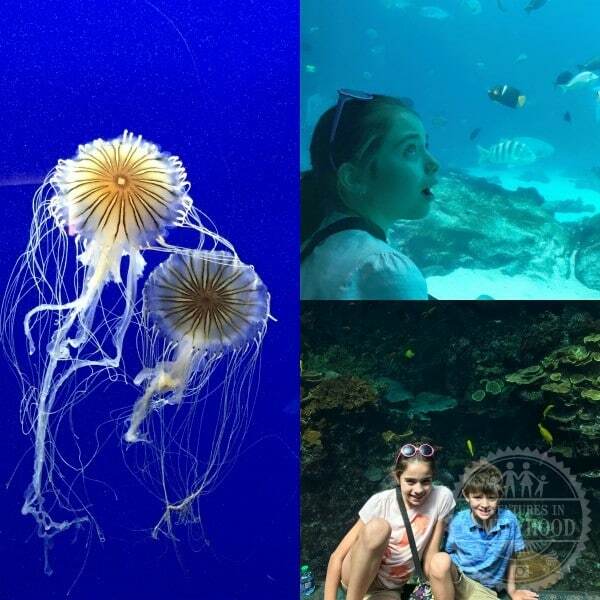 It has the right combination of shows, interactive experiences and amazing sea creature displays. The AT&T Dolphin Tale Show is a must see! We also spent a lot of our time in the Ocean Voyager exhibit mesmerized by their giant whale sharks. Our kids were too busy having fun to realize they were learning too! After a long day at Georgia Aquarium, we headed to Centennial Olympic Park to relax. 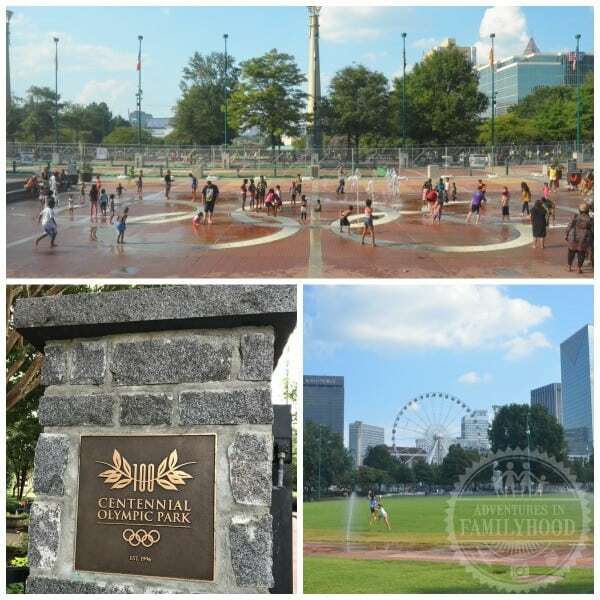 Located across Baker Street from both World of Coca-Cola and Georgia Aquarium, Centennial Olympic Park is a great place for the kids to take a break and let off some steam. The side closest to Pemberton Place includes playgrounds for kids of all ages. At the far end of the park, closest to the Atlanta Skyview Ferris Wheel, is the Fountain of Rings. It’s the world’s largest interactive fountain to incorporated the Olympic Rings symbol. Kids are welcome to play in the Fountain and enjoy the synchronized water and music program. The park is also ideal for picnics or just relaxing on the lawn. During our visit, we noticed several areas of the park were under construction as the park is being expanded and improved. That means it should be even better the next time we visit! Who says you can’t get good pizza outside of New York? 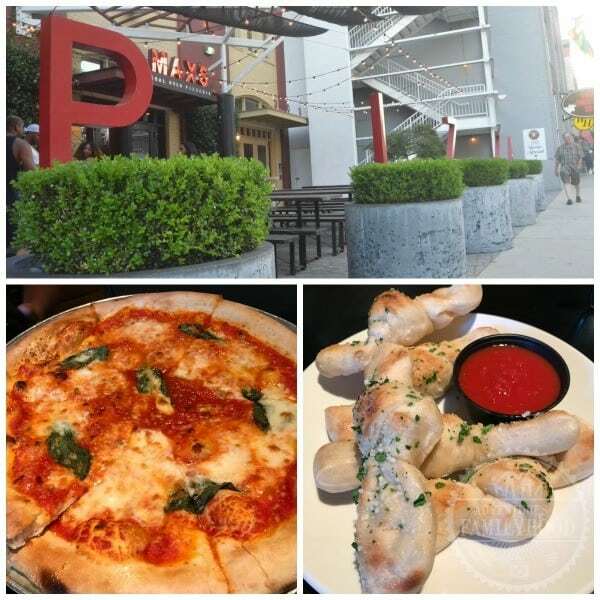 When in Atlanta, Max’s Coal Oven Pizzeria is the place to go for authentic New York style pizza. Max’s is just a short walk from both Georgia Aquarium and Centennial Olympic Park. The restaurant had a family friendly vibe. 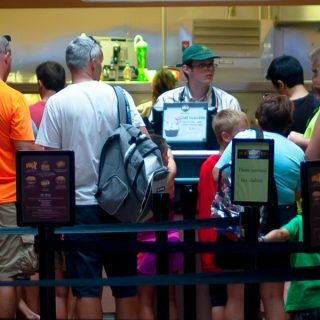 You’ll hear the hustle and bustle from the open kitchen so we didn’t have to worry about our kids being too loud. The menu included salads, sandwiches, wings and pizza. We tried the Margarita pizza and it was delicious! Their pizzas come with 6 slices so they’re perfect for 3 people to share. However we’d suggest ordering at least 2 pizzas. They’re that good! The only time we had to use our car during our trip was when we visited Zoo Atlanta. It was a 10 minute drive to the historic Grant Park neighborhood. Zoo Atlanta is home to the only Giant Panda twins in the U.S. In addition, they house over 1000 animals, representing more than 200 species from around the world. 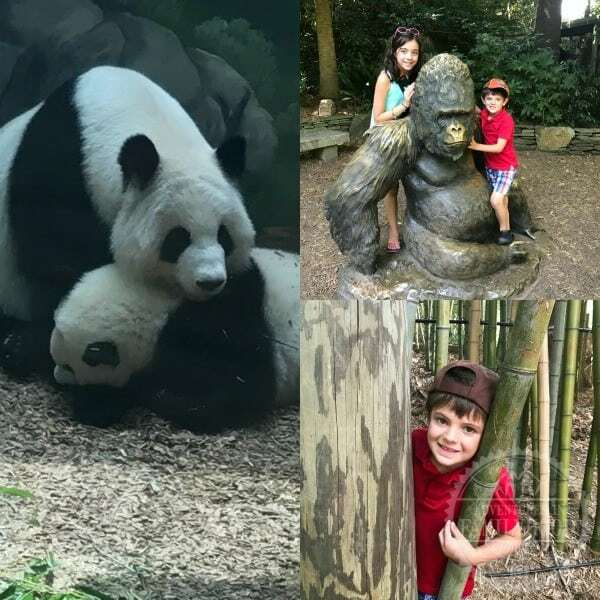 Like the aquarium, I was impressed by the size Zoo Atlanta and how easy it was to explore the facility in just one visit. A bulk of our time was spent not only watching the Giant Pandas, but visiting the Gorillas and watching them interact in their habitat. Zoo Atlanta also has a petting zoo, carousel, train ride, ropes course and an interactive splash area. ‘What’ll ya have?” No visit to Atlanta is complete without a meal at The Varsity. They’ve been serving Atlanta hot dogs and hamburgers since 1928. They even have their own lingo. The Varsity is famous for the Frosted Orange milkshakes (or F.O.) and homemade fried pies. 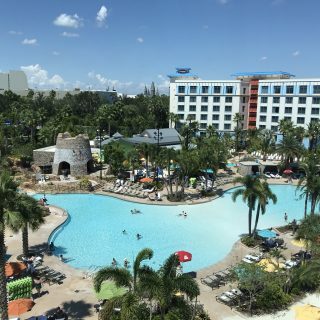 The fun, nostalgic vibe makes it a good destination for families. I, of course, had an F.O. along side my Slaw Dog and Onion Rings. Yum! 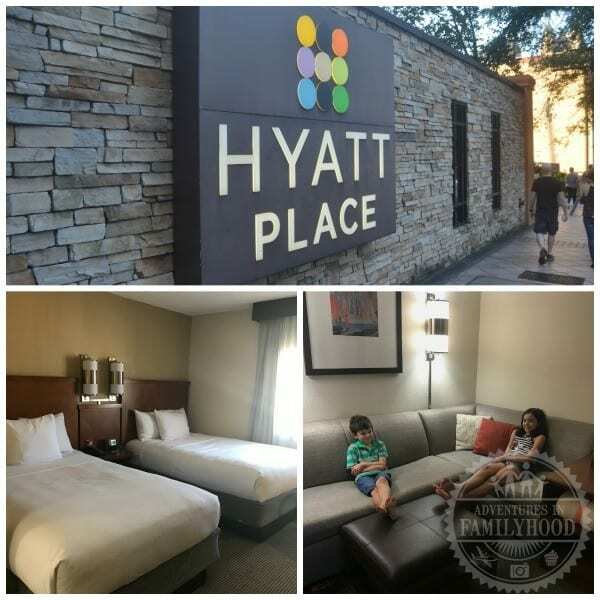 Accommodations for our trip was provided by Hyatt Place Downtown/Atlanta. Conveniently located on Peachtree Street NE, it was only a short 10 minute walk to Georgia Aquarium, World of Coca-Cola and Centennial Olympic Park. Parking lot is conveniently located onsite which made it easy to come and go as we pleased. You also had the option of taking their complimentary shuttle to the major attractions. Each spacious room in the hotel is a suite. Our room was furnished with 2 double beds and a queen sized pull out bed in the corner sofa. It was more than enough space for our family of 4. Our only issue was that the bathroom was on the small side. However, there was plenty of room outside the bathroom for getting ready in the morning. We also had kitchenette area with a mini fridge which is helpful when traveling with kids. Each morning we were treated to the hotel’s complimentary breakfast buffet. Hot buffet items varied by day but usually included eggs, either pancakes or french toast and bacon or sausage. Cold items included cereals, yogurts, and fresh fruit. There was also a selection of bread items and pastries. Also on hand were juices, milks, teas and coffee. We appreciated the serving suggestion cards that were at each station. By the end of our stay the kids were making yogurt parfaits while I was enjoying an egg creation. While we enjoyed both the ample space and complimentary breakfast, what really made our stay was the staff. Each and every member of the Hyatt Place staff we interacted with was respectful and professional. We were often asked how our day was going and were always welcomed back to the hotel upon returning. This hospitality sets Hyatt Place apart from other hotels we’ve visited. This is just some of the family friendly fun waiting for you in Atlanta. We can’t wait to go back to see even more. 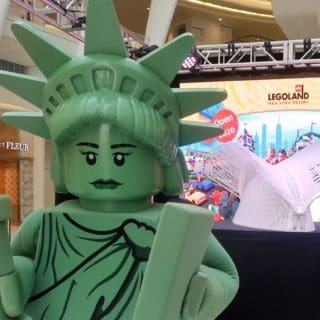 For help with planning your Atlanta family getaway visit Atlanta.net.